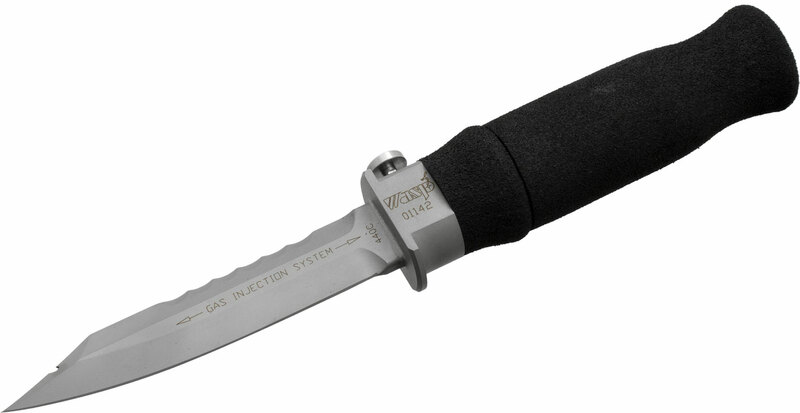 Introducing the WASP Injection Knife. A multi-shot gas injection weapon that is devastating to any living creature and will drop some of the largest mammals in a single stab. This easy-to-use, easy-to-reload weapon delivers up to a 24g shot of compressed gas at 800 psi. on land or underwater. It is silent when used and deadly to our enemies. No need to take a chance that the enemy can come back to attack you. For many years I have spent time in the remote back woods as a rock and ice climber. I have seen bear, bobcats, mountain lions, and many other potentially dangerous animals. In years past, I have armed myself with a handgun. In today's world though, carrying a firearm into remote areas is not acceptable and in some cases even illegal. I see many people going into the back country who are oblivious to the dangers that they could potentially be facing. These people don't realize that once you enter the wild you become part of the food chain. Carrying a regular knife is useless against a bear or similar predator, but the WASP with its massive injection of compressed gas is devastating to mammals of any size. Have you ever seen a doctor administer an injection. Before injecting the medicine into the patient, the doctor makes sure to remove all air bubbles. Why? Because a bubble the size of a BB can cause a blockage and kill you. Now, imagine injecting 40-80 cu. in. of gas in to something. Not only will the presence of gas in the system cause extreme trauma, but the sub-zero temperature of the gas will also freeze any surrounding tissues and be devastating. 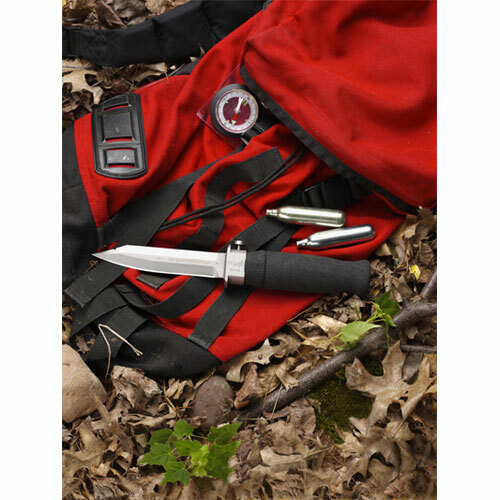 So before you go on your next backwoods hike be sure to pick up a WASP Injection Knife! Nobody wants to engage in hand-to-hand combat with a dangerous marine predator. These situations, as uncommon as they may be, can occur. Until now, the diver has been extremely vulnerable and defenseless. 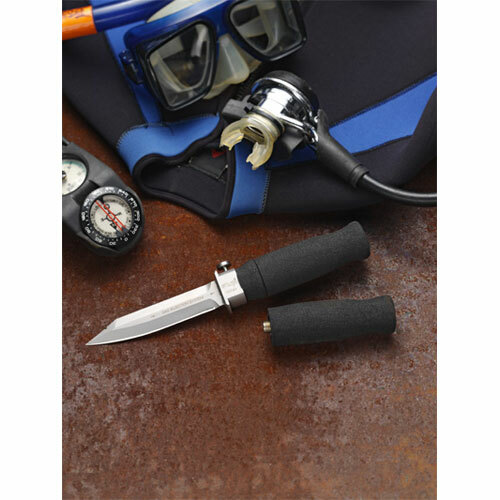 The WASP Injection Knife gives you the ability to defend yourself with deadly force and, if nothing else, it gives you peace of mind and increased comfort while reducing diver stress levels. 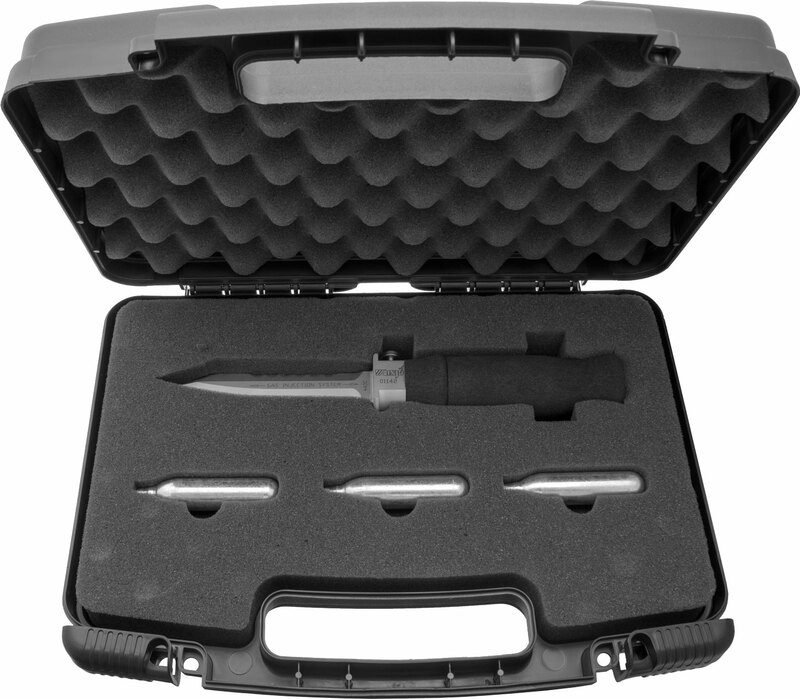 Please note, KnifeCenter does not sell Co2 cartridges but can be found at your local hardware or sporting goods store. Ok. I know what most of you are thinking. This knife seems WAY overpriced. But you’re not thinking big. 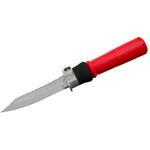 The biggest thing that I would suggest is a timed release mechanism that you can activate for knife throwing. 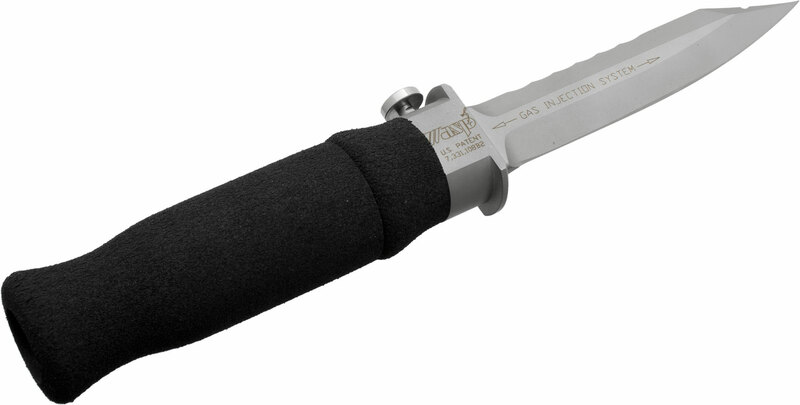 I’d love to be able to set the timer for 3 seconds, throw the knife into some polar bear’s throat.The only other thing I’m sad about with this knife is the shotty blade quality. 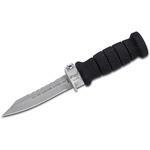 Stainless steel is a TERRIBLE blade steel for most fixed blades (and EDC knives in general. It would be sweet to see this knife in some Bohler M390, so that it actually has some decent edge retention. Not meant for peeeling potatoes. I found this knife to be large and cumbersome for peeling taters. I really don’t think it’s the right knife for the job. I accidentally popped the button while I was peeling taters and my tater vaporized into mash all over me. Now had I been doing this in a bowl it would have been one thing, but I ended up wearing a jacket of mashed potatoes. This knife seems a bit excessive for regular use. This knife is amazing. I have been able to completely knock my whole house down due to the amazing and powerful co2 injection. One stab into the siding, half of my house was down. Once this happened, a T-Rex appeared out of nowhere from under the foundation. From my call of duty throwing knife skills, I threw my WASP right at the T-Rex's chest and it fell instantly. I highly recommend this bad boy, dinosaur slayer. Not only can it take down big items and mammals, it is incredible for pimples. I once stabbed a pimple on my face with the WASP and boom, it was gone, exploding into thin air. There is nothing too big or small that this thing couldn't handle, I love my WASP. 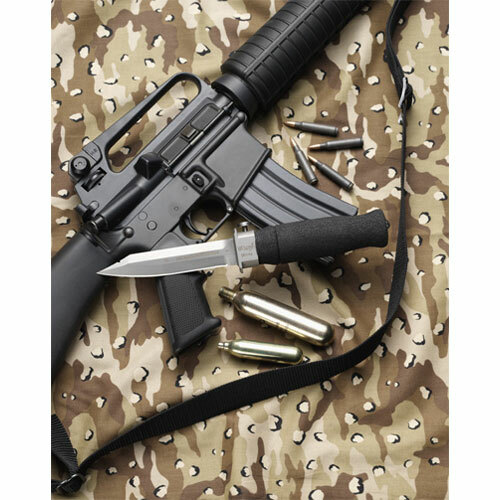 Hey, I wanted to share "WASP Injection Knife Fixed 5.25 inch Bead Blast Blade, Black Neoprene Handle" with you from KnifeCenter.